Test laboratory (n. 0095) operating in compliance with UNI CEI EN ISO / IEC 17025 standards for chemical analyses, mechanical tests, metallography, corrosion tests and non destructive tests on steel and non-ferrous metal products, since 18/05/1995. 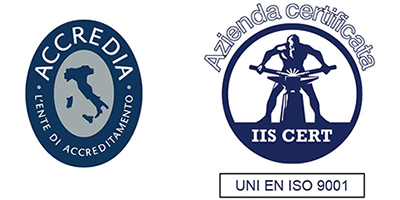 Note: ACCREDIA accreditation certifies the skill and impartiality of the staff, the company’s independence in the performance of its activities and the suitability of the company’s instruments and equipment, as well as compliance with UNI CEI EN ISO/IEC 17025 standard and ACCREDIA prerequisites for test and calibration laboratories. For the accredited tests, see www.aqm.it. Calibration centre (n. 151) operating in compliance with the UNI CEI EN ISO / IEC 17025 standard for calibration of hardness testing machines, Charpy pendulum impact test, tension-compression testing machines, calibration of hardness and microhardness testing machines. ACCREDIA accreditation guarantees the compliance with common standards of measurements within the EA (European Cooperation for Accreditation) system. Nadcap accreditation for “Materials Testing” Processes. • mechanical tests according to ASME A112.18.1-2018/CSA B 125.1-18 (Sect. 4.9 limited to Inorganic analysis, excluded clause 5.9, 5.12, 5.13),ASME A112.18.2-2015/CSA B 125.2-15,IAPMO/ANSI Z1157-2014e1, CSA B125.3-18 (limited to supply line stops, ball valves), ASME A112.4.14-2017/CSA B125.14-17, ASME A112.19.2-2018/CSA B45.1-18 (excluding Sect 7 and 8), ASME A112.19.3-2017/CSA B45.4-17 (excluding: 4.5 and 4.6), CSA B45.5-17/IAPMO Z124-2017(excluding: 4.5, 4.6, from 5.12 to 5.18 and from 5.20 to 5.25), NSF/ANSI 14-2017 (limited to 5.9.1, 5.9.2), CSA B45.11-17/IAPMO Z401-2017 (excluded 5.7, 5.9). • chemical analysis according to NSF / ANSI 372 for determination of lead content in accordance with the requirements for low lead. AQM has been the IIS (ITALIAN WELDING INSTITUTE) Centre of Excellence for eastern Lombardy since 2001. The AQM welding school is the first approved IIS training center and represents it in Eastern Lombardy (BS, MN, CR, BG). IIS-approved training centre for welders of polyethylene pipes and fittings (approval certificate no. 013P). IIS Cert has approved the AQM Non-Destructive Test Centre (certification and approval no. 004PND). Authorisation to operate as an ATB (Authorized Training Body) for the provision of training courses for International Welding Specialists and International Welding Inspector. AQM’s Quality System is also certified to the UNI EN ISO 9001 standard for the following activities: “Design and execution of consultancy services and higher and continuous training in the areas: organization, quality, environment, safety, materials and control of products, production processes and design, practical welding courses on metallic materials. Design, development and execution of laboratory tests (destructive and non-destructive). Execution of calibration tests”. Sectors EA 34, 35 (professional services for business) and 37 (training). The AQM Training Centre has held Lombardy Region accreditation since 12 July 2002. Authorised trainer registration no. 0109 dated 01/08/2008. AQM is a registered member of QuESTIO (Quality Evaluation in Science and Technology for Innovation Opportunity), knowledge base for Centres of Research and Technological Transfer (CRTT) of Lombardy Region. AQM is a full member of the Lombardy Aerospace District Promotion Committee Aerospace Cluster (www.aerospacelombardia.it). Aqm is a research member of Lombardy Automotive Cluster. AQM accredited by innexHUB as a provider of training and consulting with a view to 4.0. CEI (Italian Electrotechnical Committee) AQM is authorised to distribute and sell CEI standards and products.